Thread: Help with blending skin tones on iPad. Hello, first post. Looks like a great community here. Im looking for help with blending skin tones on the artrage iPad app. I have to teach a lesson on digital art using it on Tuesday. The students will be painting a portrait of themselves or someone else. I'm working on a personal demo right now and then will do a second one long with the students. I'm having some serious difficulty blending the skin tones. The tutorials I've been looking at make it look pretty simple. Just using the paintbrush, changing the value, and then blending with the palette knife. I can't seem to get it to work. Not sure what the settings need to be. Does anyone have suggestions? I'd love to be able to use a pencil tool to blend, but I don't think I can get it large enough. I've tried the marker, but is it possible to blend it? 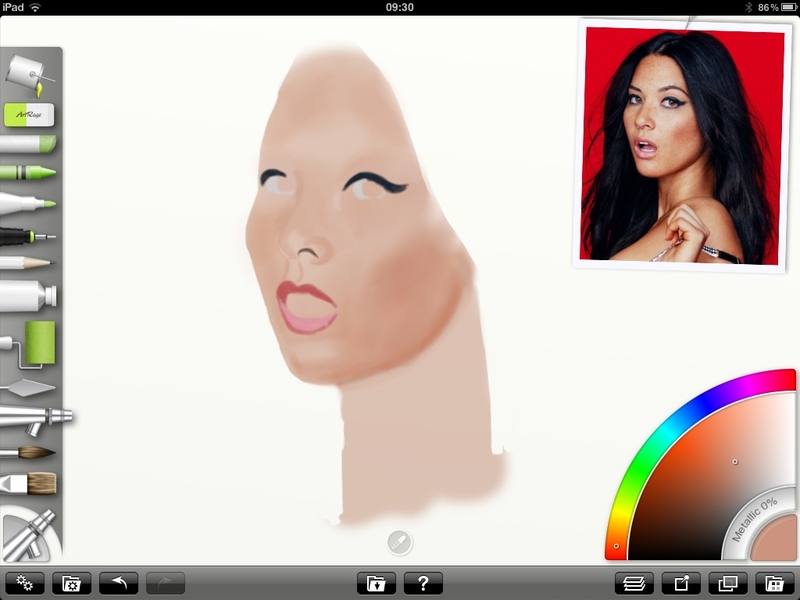 I have attached the original image and the painting I am working on...the beautiful Olivia Munn. Anyways, any help or suggestions would be greatly appreciated. I managed to get the eyes correct. I'm happy with that, but the skin is driving me up the wall. Even though ArtRage has a lack of blending tools (in my opinion) you can still do a lot of things with it. 1) Blending Knife can be used with various sizes and pressure settings to achieve different results. I don't like Flat knife personally, because it takes too much paint and blends it too strong, even if I push slightly. 2) Try using Wet Knife at small size with various settings. Play with it freely and see what you might like. I blends colors well and you can adjust many settings for the way the paint will blend. 3) Oil Brush might be good for blending if you use it with Thinners set to 90-99%. The paint becomes transparent and you can cover areas with the same paint color but in different amounts to blend it with other color. For better result you can use Soft Knife then to blur the edges that might appear. Also try Oil Brush with low thinners, but 0% of Loading. That way you won't put any paint, just blend things that are already on the canvas. 4) Airbrush is a very nice tool, especially now when we have Opacity and Blend Mode settings. Try playing with it, you can do very great stuff with Airbrush. It doesn't really blend colors, it puts ones above the others smoothly, appearing nice blends. Also try different Stickers with low Opacity. 6) For 5) there's another good blending tool - Crayons. Try setting Softness to higher values and see how colors blend. The result becomes better to see with Roughness 0%. 7) Felt Pen is good, but you have to do some practice with it in order to adopt to it's behaving. With high Wetness setting and Art Pen On you can achieve great blending results. 8) Don't forget to use different layers while painting, that way you can achieve some interesting results. 9) And last, but not least: EXPERIMENT YOURSELF. Play with tools, change their settings randomly, paint chaos and see what is good for you, if you have interesting results - save Presets and come back to them later. No one will blame you if you consider making your way of drawing. That's what most artists do - experiment a lot and see what suits them the most. And then they practice their techniques a lot to achieve mastery. I'm not a pro or master at all, because I haven't been painting for a long time, but when you know methods you can do something. I don't like the result here personally, just wanted to try myself. Ed. : Just noticed you're working on iPad, everything I said so far was about ArtRage 3 Studio Pro for PC. Don't know about AR's features on iPad, sorry. They should be mostly the same I think. Last edited by Null; 02-10-2012 at 11:53 PM. I like working in chalk and find no problem using the knife to blend. I also drop the settings back to zero on a painting tool and blend with that. Again I am not on iPad, hopefully Saphire will offer help to you as she is excellent on the iPad. Welcome aboard Tazz, I am in the process of creating a script on the Ipad using different mediums it's much easier to watch then trying to explain. I will post the script as soon as I have finished it and checked it out on my laptop in AR 3pro. If you only have the iPad to view the script I will try and upload it to utube. Thanks for all of the replies. I've been working away and managed to bang out some pictures. Not the original one I've been working on, but I changed my focus for a few. I will post below, I imagine these should go in the critique section though. Wow, you have have been busy, the first painting you have done a brilliant job, the fact that there is very little blending doesn't matter it works exceptionally well. The baby is great apart from the skin tones they are a little bit to strong IMO but your tecnique is great. Any photos I am reproducing in any of the mediums I take the skin tones from the the reference picture. This is what I have done so far using the airbrush, this just a quick screenshot..
Last edited by Saphire; 02-11-2012 at 11:45 PM. May I ask what the settings were on the airbrush? Were they consistent throughout or did you change them frequently? It looks as though I need to practice with that tool. Also, when you say you take the colour sample from the reference image, how do you pick the colour precisely? When I select from the reference image I am rarely happy with what colour is selected. Thank you Tazz, I am constantly changing the size, the opacity I change depending how heavy I want the strokes. I am away at the moment and working purely on the iPad, I will fire up my laptop and export the script to check it and I will post it, it shows up what tools I used and the setting. I still find it difficult having to talk to my iPad, give me half an hour and I should be able to post the script ignore any mistakes in the scripts I tend to do something don't like it then rub it out. Tazz I havn't been able to fully test the script so hopefully it will work, you have to play it back in ArtRage pro on your main computer. Last edited by Saphire; 02-13-2012 at 02:30 AM. Excellent. Thank you very much. I will check it out soon.